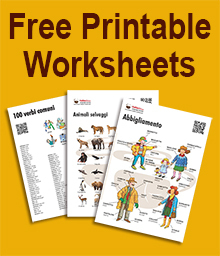 This collection of Italian grammar worksheets is mainly aimed at Anglofons students with basic level of Italian (A1-A2). 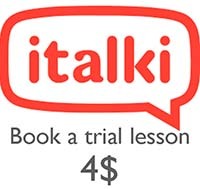 The explanations are provided in the two languages (Italian-English) arranged in parallel texts, as the only explanation of Italian would be too difficult for beginner students, and the only explanation in English would not help the students to improve their Italian. Each grammar worksheet contains many practical examples, some self-correcting exercises, and, whenever possible, theyalso have correlated video references, or references for intermediate and advanced level students who want to deepen the subject.